Earlier in the year, the WordPress theme store Themify announced the release of Ultra, a flexible and responsive WordPress theme that gives you the power to create an unlimited number of layouts using a user-friendly drag and drop page-building interface. There’s been a sharp increase in the number of these types of “all-in-one”-style WordPress themes over the last two years — and it’s easy to see why: because they empower anyone, regardless of their technical experience, to create professional-looking website designs. Let’s take a closer look at Ultra to see you what this new all-in-one solution can do. Once you have activated Ultra, you’ll be prompted to install the Themify Portfolio Posts WordPress plugin. You’ll then move on to the settings area — which is where you’ll realize how many options Ultra actually gives you. 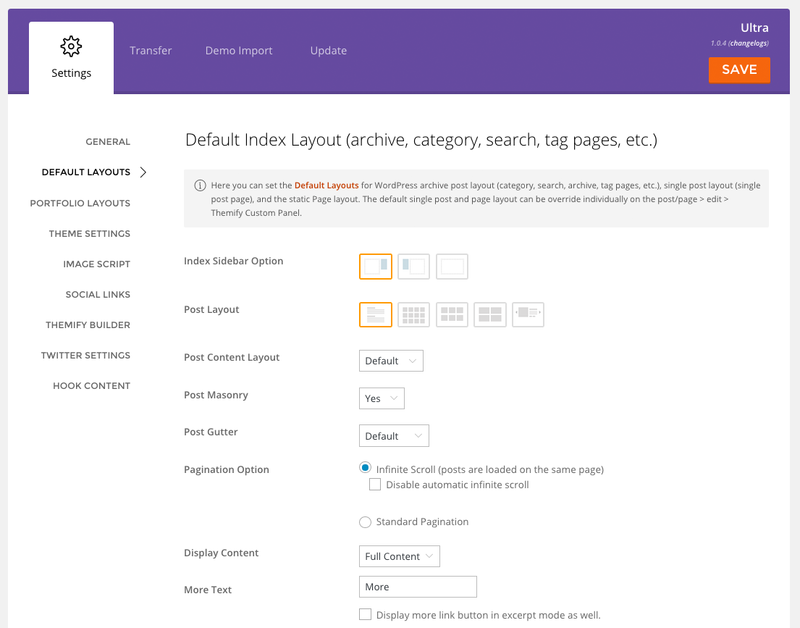 The general settings area looks great and is divided into nine different categories: General, Default Layouts, Portfolio Layouts, Theme Settings, Image Script, Social Links, Themify Builder, Twitter Settings, and Hook Content. In the General Settings area, you can add a favicon (the site icon that shows up in the browser tab) and insert custom code into your header and footer. The Default Layouts category lets you position your sidebar on the left or right, or remove it altogether. One of the best options in this area is the Post Layout. 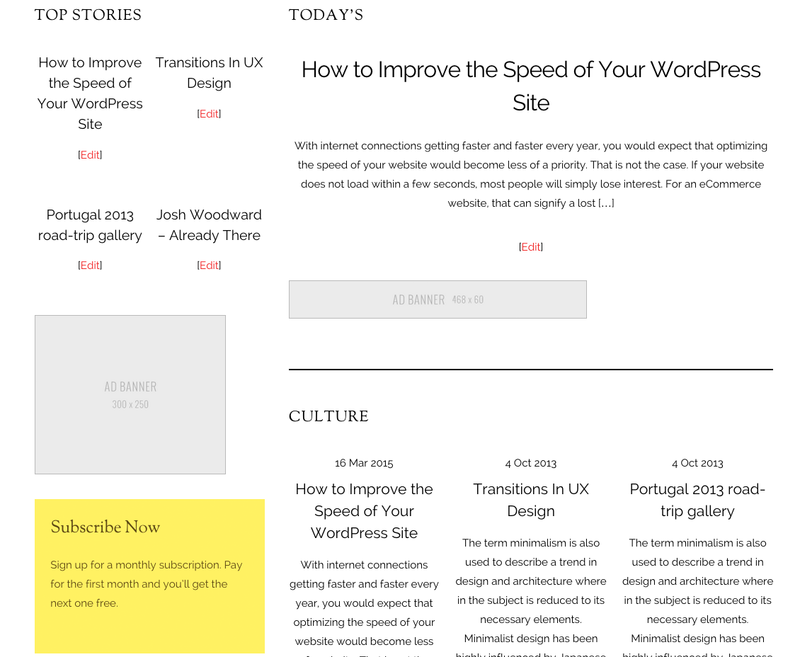 You can display blog posts in a list, in three different types of post grids, or in a post slider. Everything about your posts and pages can be adjusted here — features such as metadata, pagination, and featured images. The Portfolio Layouts page has similar options, too. 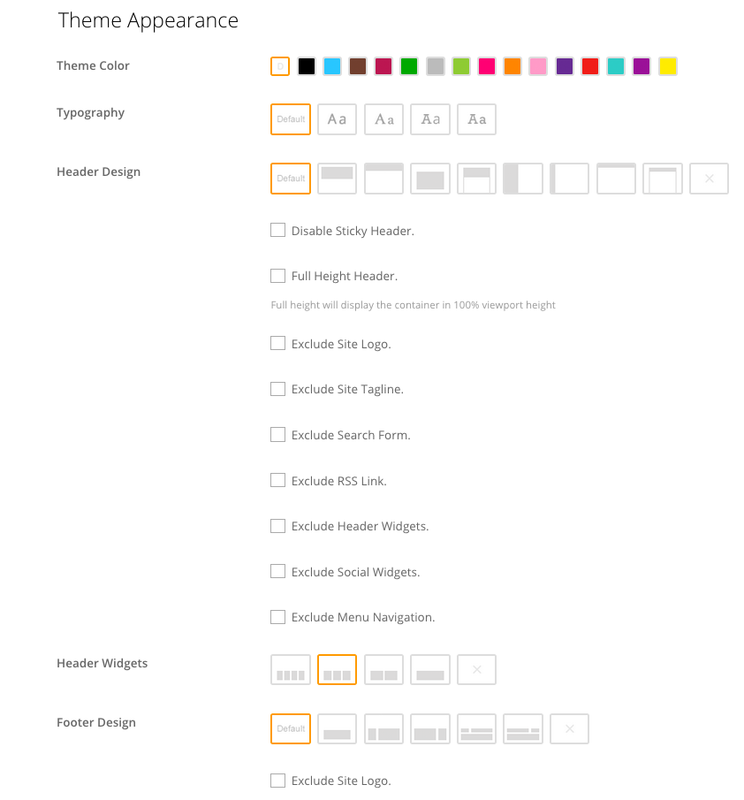 The Theme Settings category offers many possibilities for customizing your website design. 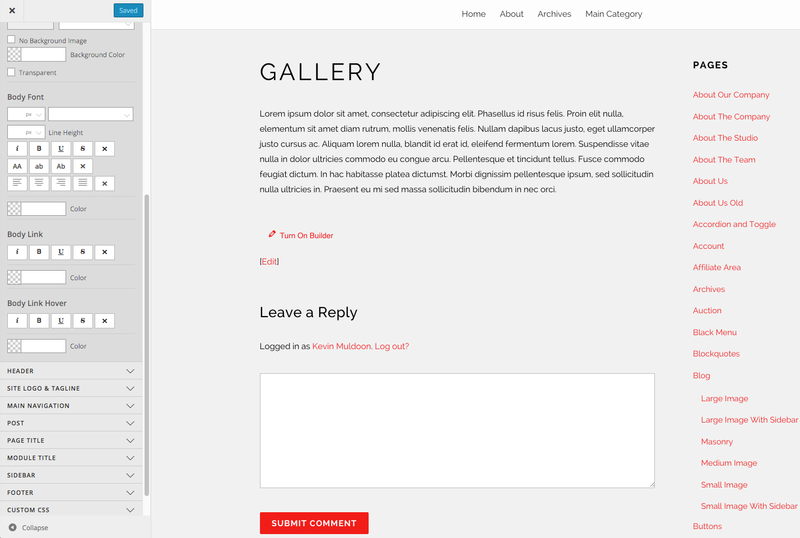 At the top of the page is an option to disable the responsive design and gallery lightbox. Underneath, you’ll find many handy options relating to the appearance of your theme. You can choose from 16 color schemes, 5 kinds of typography, and 9 different header designs (including header block, left panel, and boxed compact, along with an option to remove the header). Header elements can be disabled, too; there are options to disable things such as the search form, site logo, and menu navigation. You can also add up to four widgets to the header area. The website footer can be modified in the same way as the header — you can choose from multiple footer designs, disable footer elements, and define how many widgets are displayed. The Theme Settings page also lets you define image filters, animated background colors, page navigation, and footer text. Out of the box, Ultra has social media support for Twitter, Facebook, Google Plus, YouTube, and Pinterest; additional social media services can be added manually. 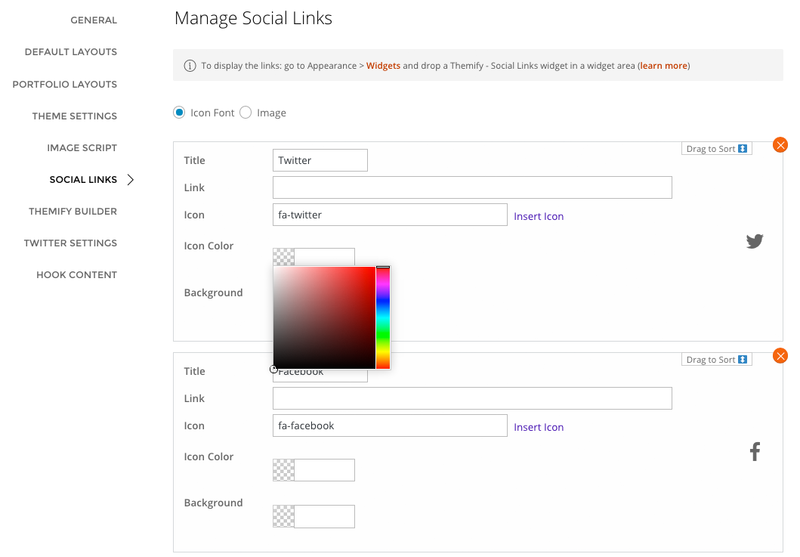 You can customize the social media name, URL, icon, icon color, and background. Alternatively, you can use an image instead of an icon. 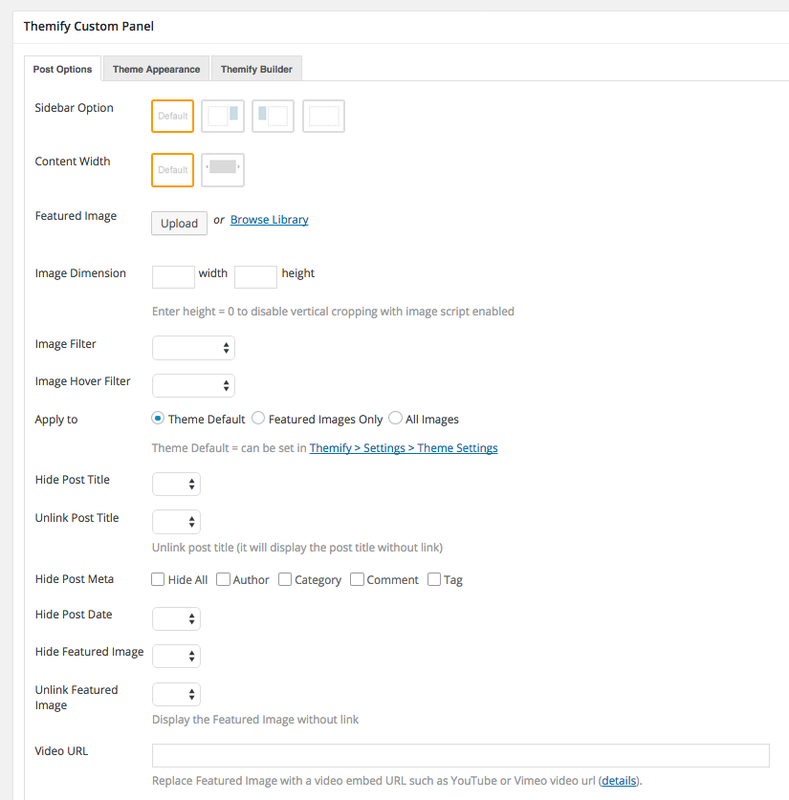 The main settings area has options for disabling the image script that automatically generates thumbnails, Themify Builder settings, Twitter API settings, and hook content. Hook content allows you to insert code into any area of your website by plugging into pre-defined locations in your website design. It’s a feature that I came to know and love through the Genesis framework. Options are available for exporting and importing theme settings. Demo content can also be imported into your website to help you see what is possible with Ultra. If you’re not sure where to start, I recommend importing some demo content so that you understand what can be achieved by using this theme. You’ll find several layouts on offer for the Themify Builder: news, portfolio, magazine, and product landing pages. Layouts can be previewed to help you see what the layout will look like on your live website. Ultra supports the WordPress theme customizer too. With this, you can insert widgets, choose theme skins, and modify the styling of your website body, header, sidebar, footer, and much more. It gives you complete control over the look of your website. You can modify colors, margins, fonts, structures, and more. Although Themify doesn’t promote the fact they support the WordPress customizer, I found it to be one of my favorite features of the theme. It’s such a useful way of styling your website design and seeing the changes being made automatically. One of the best features of Ultra is the capacity to customize every single page on your website in a unique way. Underneath posts and pages, you’ll see the Themify Custom Panel. 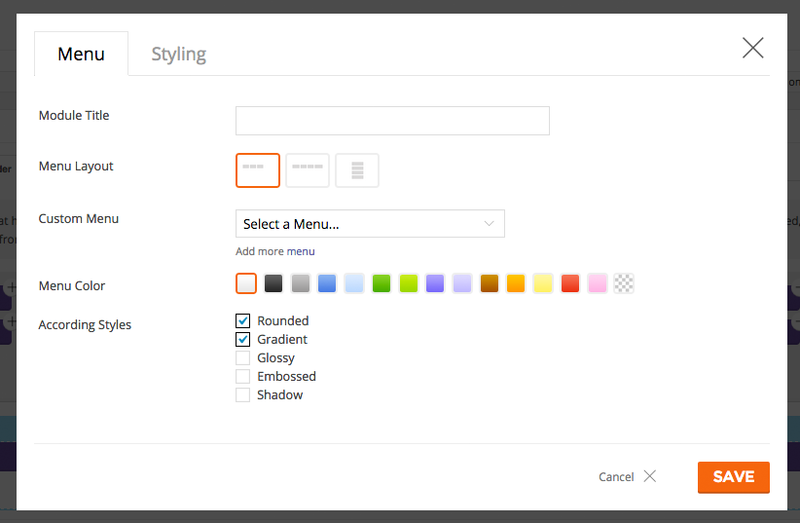 In posts, you’ll see options for the post, theme appearance, and Themify Builder. Pages have additional tabs for query posts and query portfolios. If you modify the options in this area, they will override the settings that you defined in the main theme options area. The Post Options tab allows you to change many design features including the sidebar, content width, featured image, image filter, and more. I love the idea that I can customize every page of my website. This is useful for styling certain areas of a website in a different way, be it tutorials, contact pages, about pages… or whatever. All the options in the Theme Appearance tab help you style your posts and pages. Everything from the main theme settings area is there. You can change colors, typography, header design, backgrounds, text colors, and much more. Themify’s page-builder is in the last tab. It offers 17 different modules. Modules include post accordion, gallery, map, video, and a widget area. Other page-building solutions tend to offer a larger variety of modules, however all the main modules you’ll need are there. In addition, the inclusion of widgets opens the page-builder up to many different possibilities. All you have to do is drag one of these modules into the canvas area below. When you do, a popup box will appear that lets you modify the settings of that module. As you would expect, the options available are different for each module. Some modules offer more options than others, but I was impressed that such simple modules as page dividers still offered many styling possibilities. 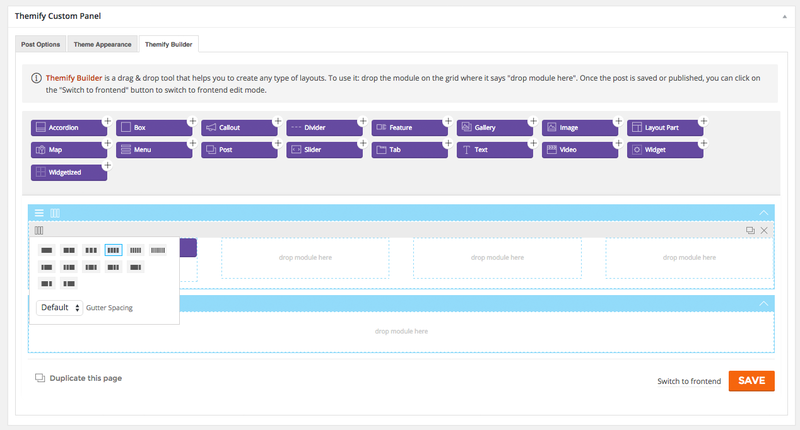 Once you’ve modified the settings of a module, you can place it into a new column or row. The interface is a breeze. After you’ve selected your structure, you can move modules around as you see fit. Most drag-and-drop page-builders force you to use either the front end or back end. Themify Builder lets you do both. I actually found the back end to be a quicker and more practical way of creating and structuring posts and pages, however the front end is available for anyone who prefers to see the changes they make on a realtime basis. 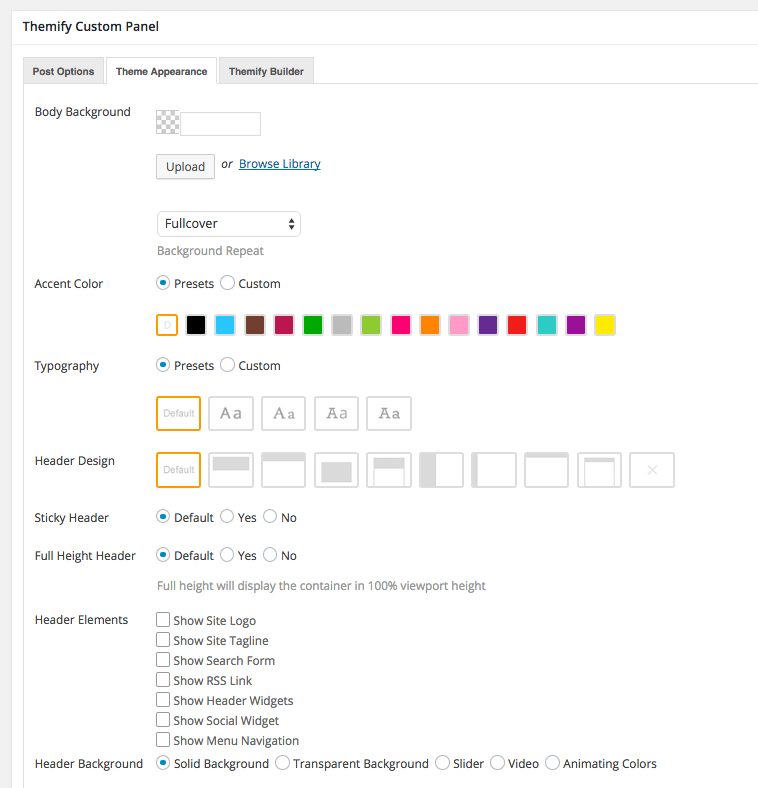 The Themify Builder also lets you quickly duplicate pages. This is useful if you want to copy pages you’ve created to other areas of your website. You can also create parts of a layout and then insert it into posts and pages. A standard license for Ultra retails at $49. If you need the original Photoshop files, there is a developer license available for $69. Both licenses offer one year of support and updates and can be used on an unlimited number of websites. If you buy a theme from Themify, you’ll receive a second theme free of charge. However, Themify’s theme club offers better value for your money. Their standard theme club membership retails at $79/year while their developer membership retails at $99/year. These memberships grant you access to all 39 current Themify themes and any new ones that are released during your membership. Themify also sells premium WordPress plugins such as Post Type Builder, Themify Builder, Tiles Builder, Announcement Bar (read our review here), and Conditional Menus. A series of add-ons are also available for Themify Builder. Collectively, these plugins and add-ons are sold for $175, however a master club membership including these products is available for $139/year. This membership option is essentially a developer membership with the addition of all plugins and add-ons, however, it only costs $40 — rather than $175 — more. It’s a good option if you’re interested in any of these plugins. Lifetime access to the master club is available for $279. It offers the same products as the master club membership plan. The only difference is there are no yearly fees. If you think you’ll renew your master club membership for a second year, the lifetime access membership plan is the best way to go. Ultra certainly lived up to its name as a powerful and flexible theme. It comes packaged with over 32 layouts that can each be used as a starting point and then modified accordingly, an easy to use drag-and-drop page-builder that can be used on the front end and back end, and fantastic support for the WordPress customizer. All of this means that Ultra is a flexible solution that fits myriad purposes. Ultra has native support for Google fonts, the WordPress Multilingual Plugin, and WooCommerce. The theme has been optimized for search engines too. If you’re on the lookout for a versatile WordPress theme that can be used to create professional websites easily, I recommend checking out Ultra. It’s got a lot of great features, is easy to use, and is fairly priced. 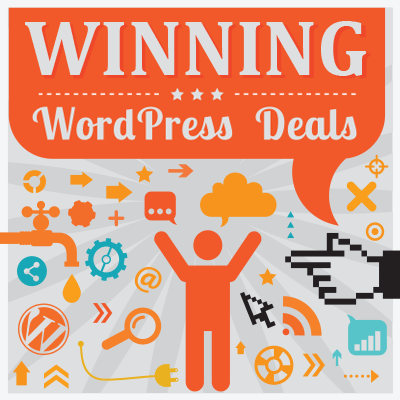 And finally, if you’re interested in giving Ultra a whirl, remember that WinningWP fans can receive a handsome 20% discount on any Themify product via our handy Themify Deal. Enjoy! Using Ultra? Let us know what you think! How does Ultra handle custom post type archives? Can you child theme?